The Finger Leather Coral is easy to care for and will grow quickly, so needs plenty of room! The Finger Leather Coral Sinularia notanda is a pretty laid back coral. With its ease of care and good looks, it makes a great coral for the beginner. It's a fast grower and an easy coral to propagate, which contributes to their predominating numbers in the ocean, but also means that it needs plenty of room in the reef aquarium. Fingered Leather Corals are not as sensitive to handling during propagation as some corals and if you can get some of the vivid leathers, you can actually have a nice little income maker. Just follow simple guidelines to keep them healthy and they will grow quickly. The range of colors this Finger Coral can be found in include purple, pink, gray, green, and yellow, but are usually brown to cream. They have stalks with tree-like branches, and from those form little branchlets. The branchlets have small autozooid (feeding) polyps which have the ability to retract fully. The tissue of S. notanda is dry and leathery to the touch, thus the term "leather coral". It's tissue is also tough, and not easily torn. The Fingered Leather Coral is known by many common names including Finger Leather Coral, Rasta Leather, Green Finger Leather Coral, Pink Finger Leather Coral, Yellow Finger Leather Coral, Green Fiji, and Sinularis Finger Leather . Because it is similar in form to other leathers, many of the same common names are used interchangeably such as Leather Coral, Finger Leather, Knobby Leather Coral, and Flexible Leather Coral. When ordering this or any other leather coral, its best to make sure you use the scientific name. An attractive easy care Sinularia species, the Finger Leather Coral is easy to keep and a great beginner soft coral. Like all of its genus, the S. notanda is one of the the most forgiving as far as light and water flow is concerned, and it is an easy coral to propagate. That being said, it does like a moderate water flow and a high direct lighting. They are fast growing, and they are toxic toward other corals due to their release of terpenes (poisons used to ward off encroaching corals), so give them plenty of room. The Finger Leather Coral can grow a foot or more, though it depends on the other softies in the tank. They can stunt the corals growth and if the coral grows too tall, it can be easily trimmed, propagated and sold for a profit! They have lobes, fingers or crests with polyps that siphon food from the water. Do not house with stony corals unless the tank is very large or your softie is small. Leather Coral Information: The Sinularia genus was described by May in 1898. They belong to the family Alcyoniidae, which are referred to as octocorals. There are around 138 species and subspecies of Sinularia (this number will grow over time). Some of their common names are Leather Coral, Finger Leather, Ruffled Leather Coral, Finger Leather Coral, Finger Leather Coral, Knobby Leather Coral, Scalloped Leather Coral, Green Fiji, Sinularis Finger Leather, Rasta Leather Coral, Flexible Leather Coral, and Knobby Leather Coral. The Fingered Leather Coral S. notanda was described by Tixier-Durivault in 1966. It is also known as Finger Leather Coral, Rasta Leather, Green Finger Leather Coral, Pink Finger Leather Coral, Yellow Finger Leather Coral, Green Fiji, and Sinularis Finger Leather. It also known by many names similar to other leathers such as Leather Coral, Finger Leather, Knobby Leather Coral, and Flexible Leather Coral. They have been propagated in captivity. Sometimes Sinularia corals are dyed because the areas some come from have been bleached due to pollution and weather patterns. Or they are dyed to get brighter colors, like fluorescent greens, but dyed corals tend to not do as well. Where Sinularia Corals Are Found: The S. notanda are found in the Indo-Pacific. 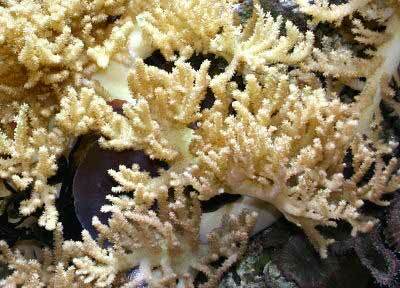 Sinularia Coral Habitat: Most S. notanda are found on vertical walls and reef slopes, attached to rubble. They can thrive in the turbid waters within large colonies, due to their thick bases. The Sinularia notanda is not listed on the IUCN Red List for Endangered Species. What do Sinularia Corals look like: The Finger Leather Coral S. notanda form colonies, sometimes quite massive, on hard substrates such as rubble and dead corals, and on vertical walls. They have stalks with tree-like branches, and from those form little branchlets. The branchlets have small autozooid (feeding) polyps which have the ability to retract fully. Its colors can be purple, pink, gray, green, and yellow, but are usually brown to cream. The tissue of S. notanda is dry and leathery to the touch, thus the term "leather coral". It's tissue is tough and not easily torn, so they are not as sensitive to handling as other soft corals, especially when propagation is done. Leather Coral Care: The Finger Leather Coral S. notanda is easy to keep, making it a great soft coral for the beginner. They like a moderate water flow and a high direct lighting. They are not as sensitive to handling as other soft corals, especially when propagation is done. But they are toxic toward other corals due to their release of terpenes (poisons used to ward off encroaching corals), and they do grow large, so they need plenty of space. They also regularly shed their top layers. A typical live rock/reef environment is what is needed for your Finger Leather Coral, along with some fish for organic matter production and plenty of room to grow. The Finger Leather Coral is very aggressive. The S. notanda is toxic toward other corals due to their release of terpenes (poisons to ward off encroaching corals). They have been known to harm some stony coral species of Acropora like the Staghorn Acropora A. formosa, some species of Porites like P andrewsii, as well as the death of Catalaphyllia, Euphyllia, and Plerogyra species. Specifically, the Sinularia polydactyla have females that remain erect and males retract and become flaccid during spawning. Other species are still being studied in this regard. The Finger Leather Coral is easy to propagate. In general, the Sinularia species can be fragged for just a small piece or for a large frag, but with a few variations in procedure. Using either procedure, the coral will more than likely deflate, but with good water flow it will recover. Corals can emit a nasty and at times noxious odor, so be sure there is good ventilation. Clean up any mucous when finished to prevent any possible health problems. The Sinularia genus is generally very hardy and adaptable, but can contract disease. Coral diseases are commonly caused by stress, shock (like pouring freshwater into the tank and it coming in contact with the leather), and incompatible tank mates including specific fish, or pests. Soft Corals for Sale: The Finger Leather Coral S. notanda is very easy to find pet shops and on line. Online they can run about $39.00 to $49.00 USD, or more, depending on size and/or color.